15 august 2008 - reassessment updated 15 sept. The Sonogashira reaction is a Csp2-Csp coupling reaction between an alkyne and a vinyl or aryl halide (Sonogashira et al 1975 DOI). 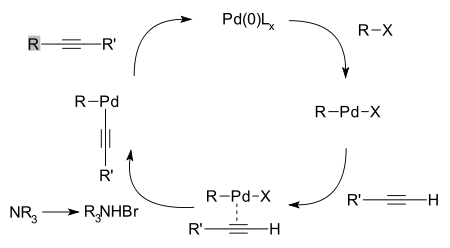 In its original scope the required base was an amine and the principal catalyst based on palladium was accompanied by one based on copper. It was soon found out that this copper is not really needed and introduces a side-reaction called a Glaser coupling and therefore many copper-free Sonogashira protocols exist. Then the amine was thrown out in favor of alternative bases and in recent reports even the ligand usually attached to palladium or even palladium itself is skipped. Kind of makes you wonder what copper/amine/ligand/Pd were doing in the Sonogashira reaction in the first place, how this changes the reaction mechanism and why people have not been paying attention. reacting iodobenzene and acetylene to diphenylacetylene with palladium as a catalyst (supported by triphenylphosphine ligands) and co-catalyst cuprous iodide. Sonogashira was able to build on earlier work done in the same year by Cassar ( DOI) using a palladium triarylphosphine complex along with a base and Heck (of Heck reaction fame) (DOI) with a diacetatobis(triphenylphosphine)palladium(II) reaction and basically Sonogashira's claim to fame is the discovery that this type of reaction is all the more milder with cuI. The first to throw out copper (again) were Genet in 1992 (166 citations DOI) and Alami in 1993 (249 citations DOI). Alami used tetrakis(triphenylphosphine)palladium(0) and a simple amine. he experienced a slower reaction compared to the copper catalyzed reaction and the reaction failed to work at all with several simple amines. The novel reaction was subsequently field-tested on the pharma-relevant enyne Terbinafine (DOI). Leadbeater (2003, DOI) eliminated the need for a metal when using microwave chemistry. Other components in this protocol were humble water, sodium hydroxide and PEO but the reaction temperature of 170°C will preclude any practical applications. The report included elemental analysis on Pd and Cu (both less than 1 ppm), a rarity in this field. In the same year Leadbeater also published a copper-free reaction (DOI) looking very similar to the 1975 Heck version (both Pd(II)) and by the way not cited. Cheng et al. in 2004 DOI went from amines to inorganic base (potassium carbonate) and used a aminophosphine ligand. In the most recent literature Sonogashira reactions are carried out with both (PPh3)2PdCl2 and an amine immobilized on a silica powder (heterogeneous!) (Sotiriou-Leventis et al. 2008, DOI) or in the inevitable ionic liquid (Hierso et al. 2007 ,DOI), (de Lima 2008, DOI). Mori et al (2008, DOI) report on a reaction with palladium on carbon (eliminating the need for a ligand), isopropanol/water and trisodium phosphate to get the job done. How does the absence of copper affect the Sonogashira reaction mechanism. In the simple model ,copper would form a copper acetylide, palladium would form a R-Pd(II)-X intermediate by oxidative addition and a transmetallation/reductive elimination sequence would do the rest. Soheili et al. (2003, DOI) favor a catalytic cycle based on oxidative addition, ligand exchange and Pd complexation to the alkyne, followed by deprotonation to a Pd acetylide and then product formation through reductive elimination. A simple mechanism offered by Gu et al. (2008, DOI) also describes oxidative addition of R-X to Pd(0) forming a R-Pd(II)-X complex followed by amine assisted ligand exchange to a R-Pd(II)-CC-R complex and reductive elimination to product. When the starting catalyst is a Pd(II) compound, the initial Pd(0) is projected to form together with the di-alkyne, a model suffering from two flaws, the di-yne is not detected and copper-free reactions were supposed to eliminate alkyne homocouplings. It may appear from this discussion that the copper-free Sonogashira reaction is a separate reaction set differing from the regular Sonogashira reaction and adding to the already numerous amount of coupling reactions in existence. In fact it turns out this particular reaction is really a variation of the Heck reaction and in fact it was Heck himself who set this ball rolling in 1974 and it is not surprising that the reaction is already called a Heck alkynylation in several reports ( DOI) ( DOI). Update: In a recent Angewandte highlight Plenio (DOI) offers a different view. According to him any sp-sp3 cross-coupling reaction is in fact a Sonogashira reaction regardless of the type of metal which can be anything from Fe, Ru, Co, Ni, Cu, Ag, Au to In be it a salt or a nanoparticle. Plenio also does not believe in metal-free Sonogashiras and discredits Leadbeaters microwave chemistry: palladium can be hidden in the solvent or co-reagents, for instance in sodium carbonate in concentrations up to 50 ppb and reactions are known that run efficiently on just 0.005 mol% Pd. As to the still unsolved mechanism for Pd(II) catalysed reactions he offers a Pd(II)/Pd(IV) cycle.